Welcome to our office. Everything we do in the practice of dentistry is designed to provide you with the most comfortable, affordable, and highest quality dental care available. We value our patients support and loyalty, and strive to create beautiful smiles through superior materials, artistry and technology. 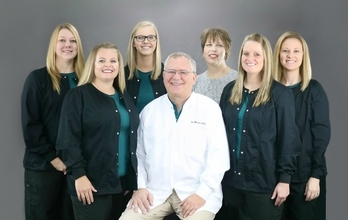 Dr. Carr and and his dental team from left to right, starting on top row: Jennifer, Emily, Marlene, Kelsey, Christy, Dr. Carr, and Kyndra. We invite you to take a tour of our office and see how we enjoy time together outside of the office. Mark L. Carr, D.D.S. • 312 N Walnut St. Cameron, MO 64429 • 816.632.5812 Take a tour of our office.